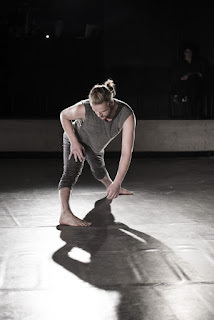 Ps: We Are All Here is the Toronto Dance Community Love-in's performance festival with an aim, it seems to me, of exposing we lovers of contemporary dance/performance to a range of approaches, to artists with innate freshness to their work whether emerging or established creators. Overlapping with the Toronto Fringe Festival, (which can be an artistic crapshoot, although this year's dance at the Fringe seems to be doing exceedingly well critically! ), ps: We Are All Here offers a curated, well-crafted view of dance performance in the summer. As I am involved in the Toronto Fringe Festival in the "little fires" production at Factory Theatre, so I could only cover a few of the imaginative artists included in the the TO Love-In's offerings this year. It might go without saying, but I'll say it anyway, they all have sparked my curiosity. There is an embarrassment of riches to choose from in dance performances this week so indulge yourself!! My first interview is with the artistic team of Alexa Mardon and Erika Mitsuhashi from Vancouver. LR: In the description of your work New Beginnings you cite string theory and multiverses as inspirations I am fascinated by and an avid reader of all things theoretical physics and cosmology….what brought the two of you to string theory and multiverses? 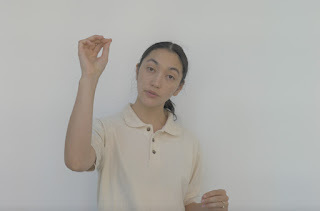 AM: Erika and I began this collaboration by co-writing a list of all the things we were interested in at the time – images, sound, approaches, and performance situations that we wanted to explore. A mutual interest in this idea of shifting a sense of time within a performance led us to discover we'd both been nerding out a bit on this idea of the multiverse – via podcasts, a book called "Sum: Tales from the Afterlives" by neuroscientist David Eagleton, and the incredibly complex and absurd show Rick and Morty. EM: Ricky and Morty was the "big bang" or spark of our work...We started our collaboration with common interests and we soon realized that the associative chain we started all fell under the this LARGE idea of the multiverse. The endlessness of this concept has been a wonderful fuel for our work together. LR: What brought the two of you together in the first place? What is your history, attraction, curiosity with each other as artists? EM: Alexa and I have been getting to know each other on many different levels over the past few years. First as interpreters in our mutual friends' works, then in professional choreographic processes and lastly as dear friends and collaborators. Alexa is one of the most thoughtful artists I know and is one of the most effortlessly intelligent movers and thinker that I have ever met. As we became better friends I was curious about her politics and socially minded work. She carries all of her knowledge in her presence and in her moving. As a collaborator she pushes our work to be multifaceted and to make art that resonates. She is game to try anything and keeps us on track when I am on a tangent about a dream I had. AM: In a sense, we have spent the last four years collaborating in the way that dancers in a process come to understand how each dancer is working and approaching movement and creating relationships that way. I think that making work together has been a long time coming; Erika's brain works in a way unlike anyone I've ever met. I saw her solo work "this room has curved edges" at the Powell Street Festival in 2014 right after I'd gotten off a 13-hour plane ride from Taiwan, and after it finished, I sat in my seat and bawled until I could bring myself to thank her for her work. Erika's ability to flesh a complex concept into an incredibly clear image, and to run with something until it becomes absurd, funny, devastating, and then repeat the whole cycle again is something I selfishly knew I wanted to learn from her. Also, I think Erika experiences in her dreams what most people take acid to experience – many hours of our friendship have been spent sitting at the Alibi Room (our favourite bar in Vancouver) over beers as I listen with complete fascination to descriptions of the detailed, warped, and often prescient dreams she has on an almost nightly basis. It's wild, and the title of the piece, along with some other things in it, come from one of these dreams of hers. LR: How do you approach what you refer to as the“sales pitch” aspect of this performance? AM: We invite the audience to join us as we attempt to do something that is probably impossible. There's an aspect of genuine desire to win the audience over in a way, and that's where the "pitch" part comes in. We are also highly aware of the structures of neoliberal, corporate consumption of immaterial or affective labour including that of artists, and the language creep that scares us. We are playing on this a little bit, but at the same time, this work means a lot to us, it's emotionally draining to perform, and we do want to "sell" it a little to the audience. Of course, not everyone will bite, and that's okay. Consent is important. We can hope you'll come along, but we can't will you to. EM: The sales pitch feels like it was a result of us attempting to bring the audience on a journey with us. We have been developing ways to have the performance have genuine moments, along with the performative. I think we walk a playful line between the different performance states and subsequently created this "pitch". It challenges both us the performers and the audience to address the inherent consent in live performance that we are all in it together. LR: You also refer to “female affective labour” what does this mean to you in general terms and in the performance work? AM: This is something I've been thinking a lot about lately. Of course, affective or more specifically, emotional labour, isn't something that only women perform. Many folks extend themselves energetically and simultaneously contract their presence either due to their social conditioning, or in order to survive the micro-violences performed on their bodies by white supremacist capitalist patriarchy (bell hooks' excellent term) or both. My lived experience of this type of labour is from a white, cis-female perspective, so that is where I'm speaking from around this term. In this piece, Erika and I are interested in how this invisible labour (which can show up as care, hosting, smiling, organizing) crosses over into the act of dance work, and the situation of performing, itself – the collapse between production and reproduction....I don't think we've fully addressed these complex ideas in the 15-minute working version we have now, and maybe we won't ever totally get there, but that's why this work excites me. EM: In this iteration, the female affective labour was alive in our bodies without us knowing at first. We host, we ease the situation, we guide, we nurture, we smile and this list goes on. We acknowledged that we were socialized to do these things and that's when we started the process of allowing it to have a place in the work. It is rather layered and veiled with so many other things in our 15 minute excerpt but it is a subject that we plan to continue to investigate. LR: What interested or interests you in being part of the ps: We Are All Here Festival? EM: Alexa and I had been rehearsing once a week, mainly accumulating research. We both had been desiring some intensive training and both planned to come to Toronto to learn from some Eastern Canadian movers and shakers. The Love-In team inquired about us presenting a short excerpt of what we have been investigating and we started building this iteration. We are both excited to present to a completely new audience and hope to gather responses that will inform the direction of the work. I am so excited by the roster for this year's Love-in. AM: Yes, up until mid-May, Erika and I were content to get together and work every Sunday morning on New Beginnings, with no intent to show it or structure it until an opportunity we were interested in came up. We both registered to take the Love-In workshops, and when Kate emailed us to ask if we were working on anything, we knew we had to jump. I'd attended the Love-In in 2013 and felt so welcomed by that dance community and impressed by the Love-In team's dedication to making things happen that they felt were missing in their city. It's a little strange that the first time we're showing this work is outside of our home city, but I think it's fitting, too. Friday night parties from 10pm-2am.